There’s very good news for fans of Franklin & Bash on TNT. The cable channel has renewed the legal series for a fourth season and there will be 10 new episodes. Franklin & Bash revolves around a pair of hotshot plaintiff attorneys (Breckin Meyer and Mark-Paul Gosselaar) who are best friends and rarely play by the rules. They agree to work for a prestigious law firm and a major culture clash ensues. Others in the cast include Dana Davis, Kumail Nanjiani, Reed Diamond, and Malcolm McDowell. Heather Locklear joined the cast in season three (replacing Garcelle Beauvais) and according to Deadline, the actress only signed a year deal. A new agreement needs to be worked out for Locklear to return in season four. The renewal comes as a little bit of a surprise considering the show’s mediocre ratings. Season three averaged 2.11 million viewers, down from season two’s 2.88 million. King & Maxwell averaged 3.11 million and was cancelled after one season. I suspect Franklin & Bash may have been saved because the show already had 30 episodes under its belt and 10 more episodes will bring it all the closer to a syndication package. It’s also produced in part by Sony and in recent years that company has worked hard to make new financial deals to save some of their ailing shows. Whatever the reason, Franklin & Bash will be back sometime next year on TNT. What do you think? Are you a fan of Franklin & Bash? Are you looking forward to season four? great news !! love the show. Glad it will be back. This is such fantastic news, love this show. 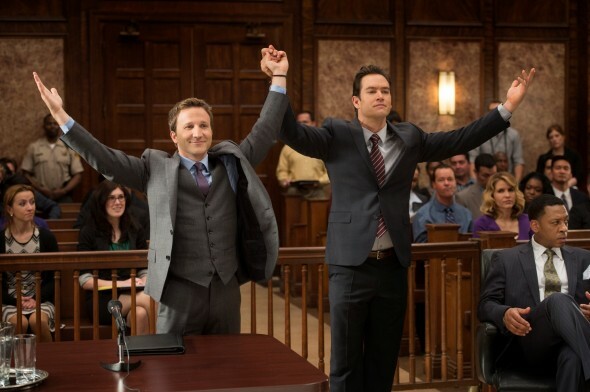 TNT has finally renewed Franklin and Bash for a fourth season. I can’t wait to see the fun and chemistry between Mark Paul Gosselaar and Breckin Meyer and the talented cast again. but I hope Heather Locklear is removed she does not fit on this brilliant fun show. Thank you TNT this is great news for the fans. I agree totally including Heather Locklear assessment. I love his show . I find it funny and relaxing.